Liverpool Overhead Railway (LOR) produced this poster around 1930 promoting cheap fares daily via ‘The Most Interesting Route’. The LOR (1893-1956) was the first electrically-worked elevated railway, the first to use an escalator, automatic signalling and coloured lighting system. 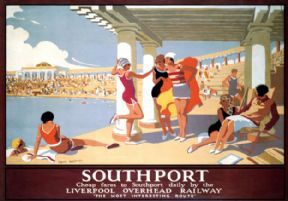 Artist Alfred Lambart has painted Southport Lido showing how popular the bathing lake was in its heyday. Women in bathing costumes can be seen frolicking and lounging in the sunshine by the waterside.